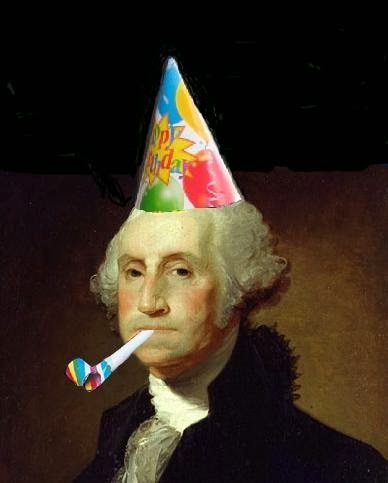 The Holiday Is "Washington's Birthday"
As we approach the Federal holiday that we will celebrate on Monday, the History News Network asks the timely question, Is It Presidents Day or President's Day or Presidents' Day? Of course, it is none of those. According to some of the calendars and appointment books floating around the Internet, Monday, February 18, is Presidents’ Day. Others say it’s President’ Day. Still others opt for Presidents Day. Which is it? Trick question. The answer, strictly speaking, is none of the above. Ever since 1968, when, in one of the last gasps of Great Society reformism, holidays were rejiggered to create more three-day weekends, federal law has decreed the third Monday in February to be Washington’s Birthday. And Presidents Day? According to Prologue, the magazine of the National Archives, it was a local department-store promotion that's responsible. Retailers discovered that a generic Presidents Day cleared more inventory than a holiday celebrating a particular one, even the Father of His Country. Now everybody thinks it’s official, but it’s not. So we see that Washington's Birthday, an observance begun for the purpose of fighting the erosion of historical memory, was twisted into an excuse to advertise department store sales during February. 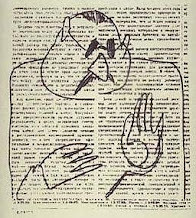 By the mid-1980s, the term was appearing in a few Washington Post holiday advertisements and an occasional newspaper editorial. Three "spellings" of the advertising holiday ensued—one without an apostrophe and two promoting a floating apostrophe. The Associated Press stylebook placed the apostrophe between the "t" and "s" ("President's Day"), while grammatical purists positioned the apostrophe after the "s" believing Presidents' deferred the day to the "many" rather than one singular "President." Well, there you have it. Believe the WaPo at your own risk. 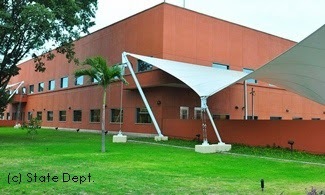 The U.S. Consulate in Guayaquil, Ecuador, has moved to a new location, and apparently that's it in the photo above. In case you are wondering about that small "c" in parentheses in the image, it's merely a copyright mark and not a classification marking. Of course it isn't a classification marking, because the building's exterior is in the public view and not classifiable. But on second thought, maybe that photo and any others like it should be classified, because I can't believe the Consulate wants anybody to see that monstrosity of a building. I'm partial to fortresses and all, but really, that one is making me get in touch with the architect within me, and he thinks the Bureau of Overseas Buildings Operations (OBO) should tear that thing down and start over. Honest to Jane Loeffler, that is a strange and ugly building! In an important symbol of our commitment and enduring relationship with Ecuador, U.S. Ambassador to Ecuador, Adam E. Namm, presided over the dedication of the new U.S. Consulate General in Guayaquil today. The new multi-building complex provides employees with a safe, secure, and modern workplace. Situated on an 11.25-acre site in the San Eduardo neighborhood, the new Consulate General includes a new office building, two access pavilions, a service/utility building, and parking. The $66.5 million project incorporates numerous sustainable features to conserve resources and reduce operating costs, including an energy recovery unit that reduces the need for heating and cooling, water-conserving plumbing fixtures, and the use of regional and recycled materials. The facility was designed by Page Southerland Page, LLC of Arlington, Virginia and constructed by Contracting Consulting and Engineering, LLC of Annapolis, Maryland. Since 1999, as part of the Department’s Capital Security Construction Program, the Bureau of Overseas Buildings Operations (OBO) has completed 109 new diplomatic facilities and has an additional 36 projects in design or under construction. OBO’s mission is to provide safe, secure, and functional facilities that represent the U.S. government to the host nation and support our staff in the achievement of U.S. foreign policy objectives. These facilities should represent American values and the best in American architecture [sic, believe it or not], engineering, technology, sustainability, art, culture, and construction execution. OBO's press kit for the project is currently mixed up, and the link for New Consulate Guayaquil's fact sheet takes you to New Embassy Benin. That's too bad, because I'd like to find out how much OBO paid to Page Southerland Page, LLC of Arlington, Virginia to design that place. Considering that the total project cost was only $66.5 million, or less than half of what a typical new embassy or consulate costs, I'm guessing the design end was practically an afterthought. Now I'll spend the rest of the day shaking off the inanity of that image.